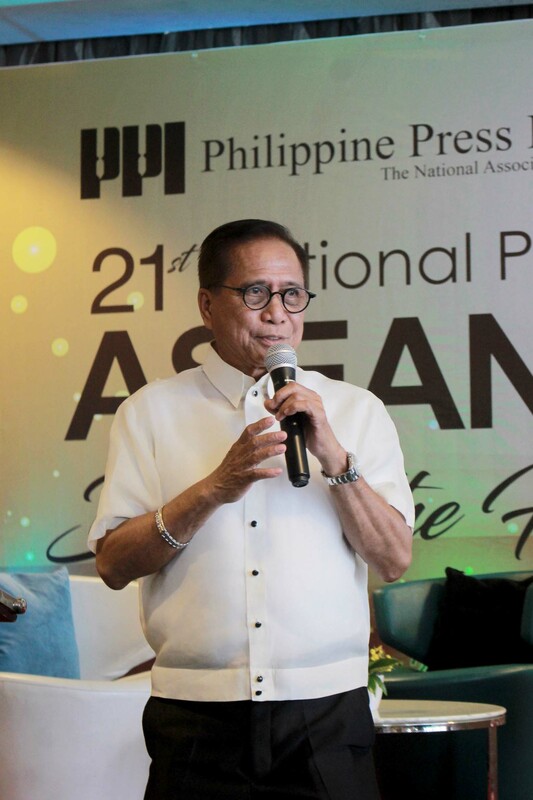 Amid the raging tension in Marawi City, presidential peace advisor on the peace process Jesus G. Dureza highlighted the role of the media in helping calm down the situation and quell misinformation, which stokes terrorism fears and plays into terrorists’ agenda. 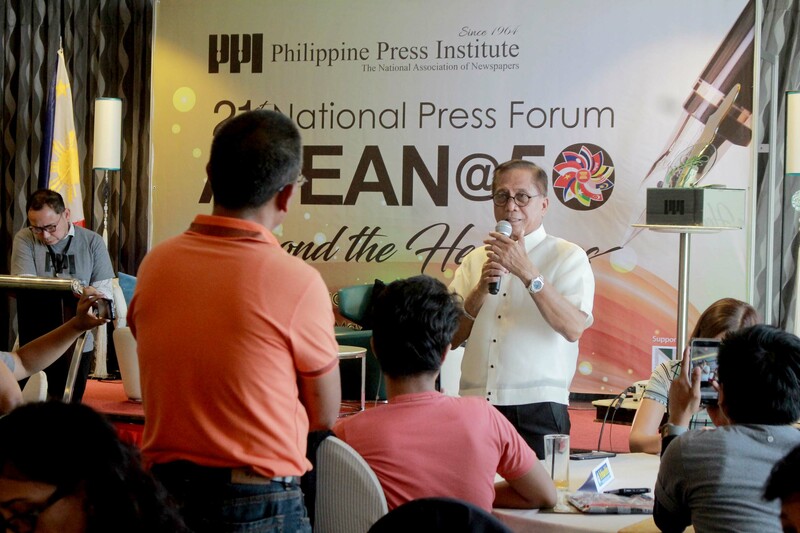 In his dialogue with the media on Wednesday, during the opening day of the Philippine Press Institute’s two-day Annual Press Forum at H2O Hotel in Manila, Dureza said the media play a critical role in pushing forward the government’s peace efforts through accurate, factual, and inclusive reporting. He said that the government’s ongoing peace negotiations with rebel forces comprise only the “small table.” The “bigger table” is where the general public sits and must buy into the peace agenda of the current administration. 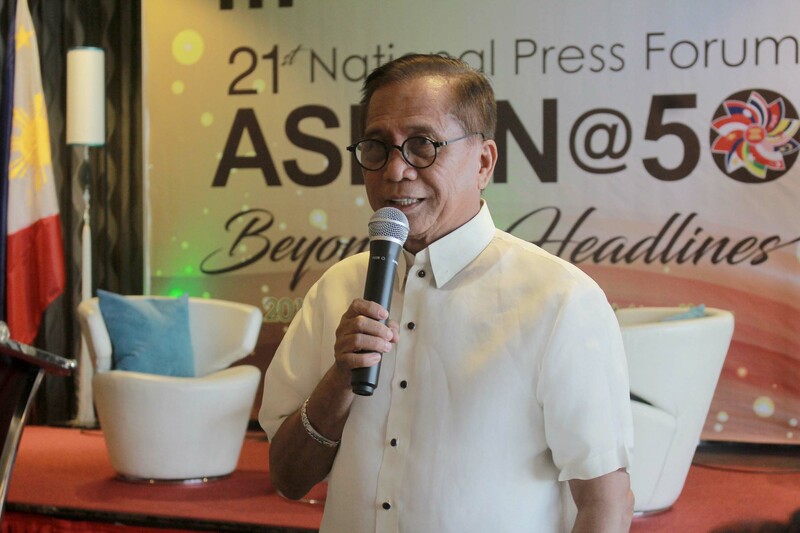 Dureza said the media must create “a bigger table” for peace work to yield positive results. In the same dialogue, Duterte, who served as PPI’s chairman-president until his appointment to his current post by President Rodrigo Duterte, said the government was expecting to complete the draft Bangsamoro Basic Law in time for the opening of Congress’s next regular session in July, when President Duterte will deliver his State-of-the-Nation Address. Dureza said that the government has reached an unprecedented fifth round of negotiations with the Communist Party of the Philippines-New People’s Army-National Democratic Front, where they have arrived at consensus points that would be finalized between May 27 and June 1. The agenda includes development initiatives for the people, talks on a bilateral ceasefire agreement, and the proposed agreement on socio-economic reforms. He defended the President’s decision to declare martial law in Mindanao, saying it’s an emergency measure meant to address the breakdown of civilian authority in the beleaguered capital city of Lanao del Sur, which members of the extremist Maute group, known to have pledged allegiance to the Islamic State, attacked Tuesday afternoon. He said the violent assault, specifically against public facilities, has led to a huge exodus of Marawi residents toward nearby Iligan City in Lanao del Norte. Dureza lauded the response of the local government of Iligan, as well as concerned private citizens, for the humanitarian support extended to the fleeing residents. He called this a “silver lining” in the cloud that’s worthy of media coverage. © 2017 Philippine Press Institute, Inc. All Rights Reserved.